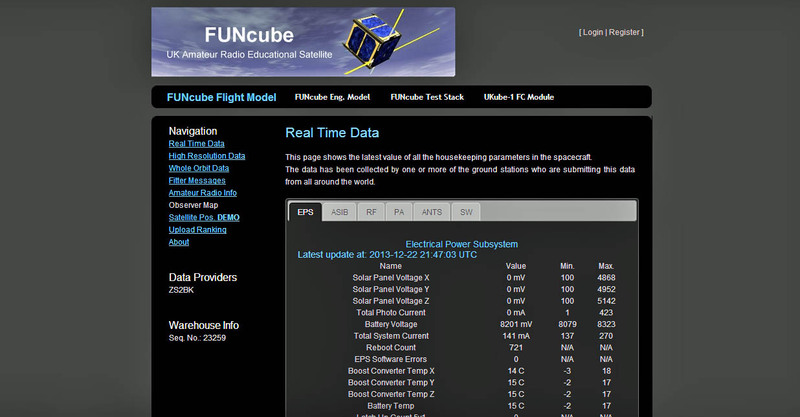 Well – FUNcube-1 has now been in orbit and fully operational for one month. We are very happy and VERY grateful to all the stations who have committed their time and effort into regularl y receiving the telemetry and uploading it to our Data Warehouse. We really want to say a BIG THANK YOU and please keep it coming. Dave G4DPZ is still busy refining the operation of the Warehouse and is promising more features over the next few days/weeks. Further updates to the Dashboard are also expected soon. If anyone knows of potential additional stations that could be established in some of the remoter parts of the globe we would be grateful to have your ideas and introductions. “Simple” stations with omnidirectional antennas, dongles and internet connected laptops would be all that is needed. We intend to keep the present operating schedule in place for the time being whilst various on board parameters continue to be characterised by the team. The present low internal temperatures being experienced by the spacecraft, at least in the northern hemisphere, are causing some frequency shifting to take place – especially on the uplink frequencies – roll on summer! We are not yet 100% certain that Object 2013-066AE is FUNcube-1 but it is looking the most likely candidate. As the launch was more than 30 days ago, the record for this object has now moved to the http://celestrak.com/NORAD/elements/cubesat.txt file and the object is now referred to as DNEPR OBJECT AE. The https://funcube.org.uk/working-documents/latest-two-line-elements/ page has been updated to match. don’t mean to be rude, but how about sending our call signs out on fitter message, for Christmas, and at least acknowledging those who provide you with data. Like many, i have provided you with hours worth of data, surely its the least you can do. Half the call signs on fitter, aren’t even data providers. Sure, i can choose to work audio when bird passes, but i don’t, i use my equipment to give you telemetry data, that must be worth something. DelfiN3XT are offering prizes to those who participate. A simple thanks from AMASAT is all i’m asking. Thanks for your comment. The people mentioned in the current thank you Fitter Messages are those who assisted with FUNcube financially before the launch, and we promised to acknowledge them in this way. But yours is a good idea. We certainly continue to be grateful for all the uploaded tlm data, do please keep it coming. We are still characterising the spacecraft, and uploading Fitter Messages isn’t yet a ‘routine’ thing we do. Hopefully this will happen soon, but I’m afraid we cant promise it for Christmas! Happy Christmas to you and the FUNcubeTeam.